Shop owners, traders, trotro and taxi drivers at Mallam Junction Ecobank have praised the Greater Accra Metropolitan Area (GAMA), Sanitation and Water Project for constructing a drain to curb the perennial flooding in the area. According to some traders, shop owners trotro and taxi drivers ghanamps.com caught up with during a rain storm on Monday that lasted for more than three hours, the area would have been flooded but for the construction of the drain and widening it at Mallam Junction. A visit to the area after Mondays down pour witnessed traders going about their normal activities likewise shop owners, trotro and taxi drivers, whiles rain water was gashing out in heavy volumes through the drains. Mr. Kwasi Adu a taxi driver who loads passengers to, Mallam and CP in an interview noted that with the construction of the drain, the perennial flooding of Mallam Junction Ecobank is now a thing of the past. A fashion designer, Aboagye Dakosta, who owns a shop at Mallam Junction Ecobank expressed relief that this year as the rain had set in so far there has not been flooding in the area, and noted that in the previous years the area experienced flooding with the slightest down pour of rain that lasts for more than two hours. 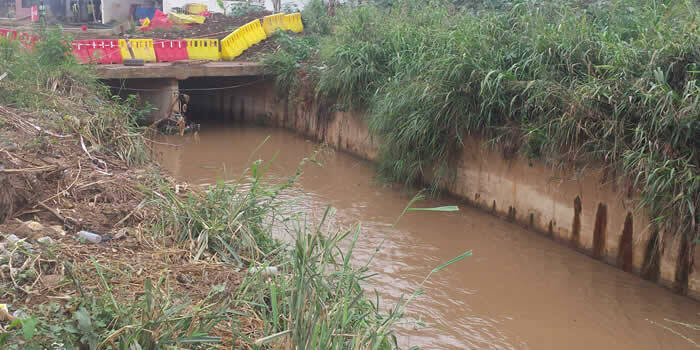 Staffs of National Disaster Management Organisation (NADMO), at the Weija -Gbawe Municipal Assembly indicated that with the construction of the drain, heavy down pour had not displaced people this time around. As officials from the Regional and the District offices of NADMO had had earlier visited Mallam Junction and its environment after a heavy down pour but did not record any disaster.